Original Editor - Tom Whyatt, Eilis Fitzgerald, Faisal Alanezi, Abdulkareem Almutairi, Sinead McCarthy, Conor McHugh (as part of the User:RCSI student project). The Apley's grind test (Apley Compression test) is used to evaluate individuals for problems of the meniscus in the knee. This test is named after Alan Graham Appley (1914 - 1996), a British orthopedic surgeon, who discovered this assessment technique. The test is performed in conjunction with the Apley's distraction test. Meniscal injuries are very common and are associated with significant pain and morbidity. Meniscal injuries are less common in children younger than 10 years old. There is a higher prevalence amongst males than females, which is assumed to be related to males engaging in more activities that create rotational injuries (contact sports). There has been no reported link to race or ethnicity for sustaining a meniscal injury. The meniscus is C-shaped cartilage that acts as a cushion between the proximal tibia and the distal femur to make up the knee joint. It has an average width of 10 mm to 12 mm, and the average thickness is 4 mm to 5 mm. The meniscus is made of fibro-elastic cartilage. It is an interlacing network of collagen, proteoglycan, glycoproteins, and cellular elements, and is about 70% water. There are three ligaments which attach to the meniscus. The transverse (inter-meniscal) ligament is anterior and connects the medial and lateral meniscus. The coronary ligaments connect the meniscus peripherally. 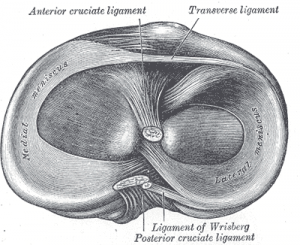 The meniscofemoral ligament connects the meniscus to the posterior cruciate ligament (PCL). The menisco-femoral ligament originates from the posterior horn of the lateral meniscus. The meniscus receives blood supply from the medial inferior genicular artery and the lateral inferior genicular artery. As mentioned earlier, the meniscus is known to have a poor blood supply, especially in the central region which receives its nutrition through diffusion. 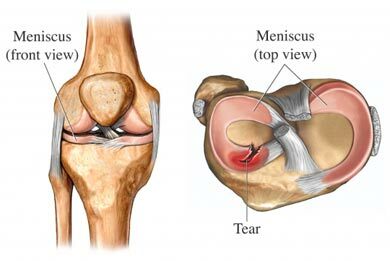 The cartilage structure of the meniscus acts as a cushion or shock absorber for the knee joint. There are several types of potential tears of the meniscus. 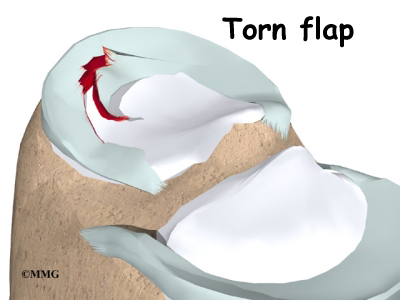 These include flap tear, radial tear, horizontal cleavage, bucket handle tear, longitudinal tear, and degenerative tear. A clinician should suspect an injury to the meniscus when a patient presents with knee pain, particularly after a twisting type of injury when the foot is firmly planted on the ground. The injury may occur with or without an external force being applied to the knee. Usually, pain is located along the joint line of the knee. Common complaints are pain and mechanical complaints such as clicking, catching, locking, or inability to fully extend the knee. These injuries frequently occur in conjunction with ligamentous injuries. When an external force is applied to the lateral knee, it can result in the "unhappy triad." This group of injuries encompasses damage to the medial meniscus or lateral meniscus with concomitant injuries to the anterior cruciate ligament (ACL) and the medial collateral ligament (MCL). When performing a physical examination, joint line tenderness, joint effusion, and impaired range of motion are the most common findings. Appley's grinding test involves placing the patient in the prone position with the knee flexed to 90 degrees. The patient's thigh is then rooted to the examining table with the examiner's knee. The examiner laterally and medially rotates the tibia, combined first with distraction, while noting any excessive movement, restriction or discomfort. The process is then repeated using compression instead of distraction. If rotation plus distraction is more painful or shows increased rotation relative to the normal side, the lesion is most likely to be ligamentous. If the rotation plus compression is more painful or shows decreased rotation relative to the normal side, the lesion is most likely to be a meniscus injury. Diagnostic accuracy studies of meniscal tests are described to have poor methodologic quality with highly heterogeneous results, therefore poor value for clinical practice. A recent meta-analysis reports sensitivity and specificity to be 60% and 70% respectively. Diagnosis of a meniscal injury by physical exam and special tests, including Apley’s grind test and Apley’s distraction test, in conjunction with advanced imaging, can guide a physician to provide the correct course of treatment. Treatment of a meniscal injury may include conservative management such as analgesia, i.e., NSAIDs, and physiotherapy. Non-operative management is the first line of treatment for degenerative meniscal tears. Operative repair of a torn meniscus is often indicated for peripheral tears because of rich blood supply. Conservative management or surgical repair is heavily dependent on the individual case characteristics. ↑ 2.0 2.1 Medial meniscus. (2018, March 14). Physiopedia, . Retrieved 11:38, May 28, 2018 from https://www.physio-pedia.com/index.php?title=Medial_meniscus&oldid=184430. ↑ 3.0 3.1 3.2 3.3 David J. Magee. Orthopedic Physical Assessment. 5th Edition. W.B. Saunders, London; 2002. ↑ 4.0 4.1 Lateral meniscus. (2018, March 14). Physiopedia, . Retrieved 11:39, May 28, 2018 from https://www.physio-pedia.com/index.php?title=Lateral_meniscus&oldid=184431. ↑ Medial meniscus. (2018, March 14). Physiopedia, . Retrieved 11:38, May 28, 2018 from https://www.physio-pedia.com/index.php?title=Medial_meniscus&oldid=184430. ↑ 6.0 6.1 6.2 Meniscus rupture. (2018, January 25). Physiopedia, . Retrieved 11:43, May 28, 2018 from https://www.physio-pedia.com/index.php?title=Meniscus_rupture&oldid=182515. ↑ Christopher Norris. Sports Injuries: Diagnosis and Management, Third Edition. Butterworth-Heinemann;2004. ↑ Patrick J. McMahon (2006). Current diagnosis & treatment in sports medicine. McGraw-Hill Medical. ↑ Scholten RJ, Deville WL, Opstelten W, Bijl D, van der Plas CG, Bouter LM. The accuracy of physical diagnostic tests for assessing meniscal lesions of the knee: a meta-analysis. J Fam Pract. 2001; 50:938-944. ↑ Hegedus EJ, Cook C, Hasselblad V, Goode A, McCrory DC. Physical examination tests for assessing a torn meniscus in the knee: a systematic review with meta-analysis. Journal of Orthopaedic and Sports Physical Therapy, 2007; 37(9), 541-50.